96 inch lounging sofa. 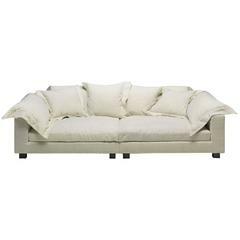 Simple lines softened with down-wrapping and textured upholstery. 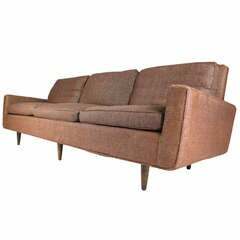 Made in LA, handcrafted, FSC Certified Wood, Goose Feathers & Down, Low-Voc Stains, Measures: Seat height 18 inches Arm height 23 1/2 inches. 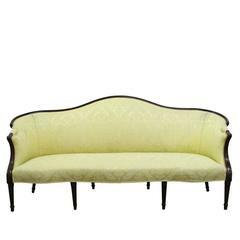 Wood wrapped French sofa upholstered in a yellow damask. Dimensions: 77" x 32" x 37". seat height 16".